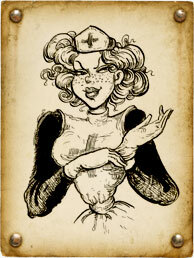 NURSE TEMPERANCE O'TURE served valiantly as a Medic in the Royal British Army. She was decorated with the HIGHEST HONOR for Courage under Fire, about which however she is Exceedingly MODEST, having told a newspaper-reporter that “Anyone in her place would surely have disarmed that ordinance using only a hair-pin, as it was the only logical curse of action.” Despite her abiding fondness for Dressing in the Uniform of her erstwhile calling, she has returned to civilian life to serve as MEDICAL SPECIALIST at the right hand of Doctor Clockwork. Nurse O'ture sets the Standard in COMPASSIONATE AND KNOWLEDGABLE Care. How many nights she has remained by a sleepless patient’s BEDSIDE! At her tender Touch and encouraging Words, all find solace in her Company. When she is not turning down the bed-clothes of a Patient on Doctor Clockwork’s Ward, she can generally be found with her arm slung playfully abut the shoulder of a fellow Ward Sister, singing a cheerful tune, or imbibing a dainty glass of Spirits at a Local Establishment. Doctor Clockwork assures his Customers that under Nurse O'ture’s capable Ministrations, the Customer will derive MAXIMUM SAFETY AND SATISFACTION from his or her MEDICAL PLAY Exertions.